The National Association for the Specialty Food Trade (NASFT) annual Fancy Food Show is held twice a year, but the summer event is the biggie. This is where industry insiders go to see, smell and eat the trends – and several years ago salted caramels popped up all over the show – and subsequently all over the U.S. and beyond! Every chocolatier and candy maker from coast to coast seems to have a version. Some are better than others, and this is true whether we are talking about actual candies, sauces or bonbon fillings, but certainly the concept of a salt enhanced caramel is a fabulous one. The salt acts both as a counter balance and an enhancement for sweet caramel and I can’t get enough of this taste sensation. 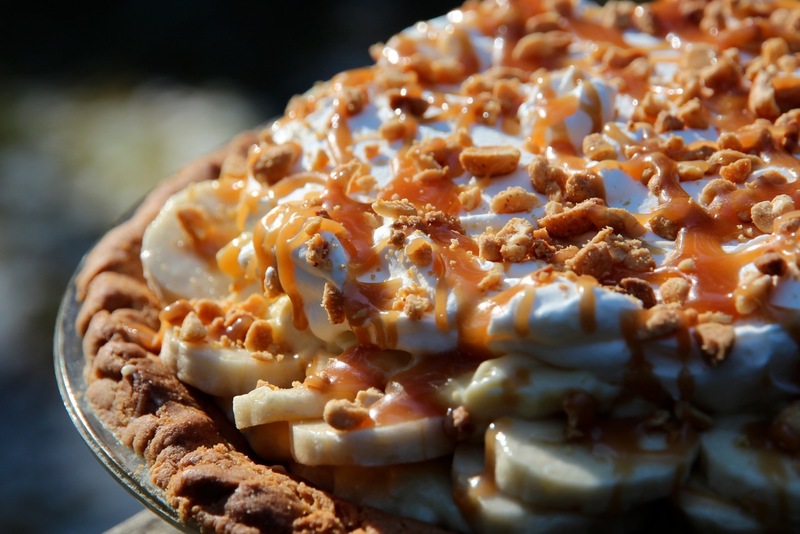 And so this brings me to another recipe from the February 2012 issue of Bon Appetit – Banana Cream Pie with Salty Bourbon Caramel. If the name of this dessert doesn’t grab your attention, I don’t know what will. The crust is peanutty and rich. It’s filled with layers upon layers of vanilla pastry cream and sliced ripe bananas. Whipped cream crowns the top and the salted Bourbon caramel can be drizzled on top (like in the pic) or served alongside. (Don’t worry, the caramel recipe makes more than what is shown in the photo. I just didn’t want to drown the pie. I did that off-camera when it was time to eat). I have to admit that I doubled the butter in the crust by mistake, but it still worked so I went ahead with the rest of the recipe. I brought this to a party with a few desserts and this one was positively attacked. For me it’s the combination of salty and sweet, crunchy and creamy, light and rich all in once dessert that makes this irresistible.